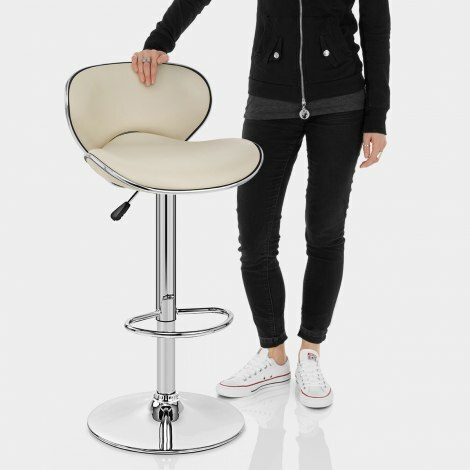 A dynamic new age bar stool, the Duo Bar Stool Cream is the epitome of contemporary class. The Duo is a modern stool but also has hints of retro styling, and so it is perfect in any location with any decor, be that a new age kitchen or a 70s breakfast bar or dining room. Well padded and accommodating, the Duo is superbly comfortable, helped by the supportive backrest that has a shape mimicking the seat. It also has a seat covered in soft cream faux leather with a chrome strip running along the edges. The bottom of the backrest extends past the seat for a more pronounced profile and greater presence, making the Duo very eye catching. The seat sits on a chromed stem, in which is housed the adjustable gas lift and 360 degree swivel mechanism, giving excellent functionality. The Duo also has a chromed footrest and sturdy circular base, which has a rubber ring beneath to protect your floor. "They look good, sturdily built and comfortable"
Excellent quality, comfy and easy to assemble. Unbelievable quick delivery! Wonderfull pair of bar stools, that look a lot dearer than they were. I'm also 6'2" and these stools are a joy to sit in the kitchen - they fit my posterior and back like a dream! Atlantic delivered as promised within a couple of days after ordering. Thumbs up all round! I bought four of the Duo stools, really pleased with them, didn’t have to pay for postage, and they were delivered the day after ordering, very impressed. We have just assembled our new stools to fit in our recently refitted kitchen. They look good, sturdily built and comfortable. We look forward to using them lots.